Jenny Nottingham is PVH’s Customer Service Employee of the Month for June. She is pictured with Paul Harris, director of Rehab Services, and Glen Washington, CEO. Martha Roush, PVH’s Customer Service Employee of the Month for May, is pictured with Mistie Best, director of Home Care Services, and Glen Washington, CEO. POINT PLEASANT, W.Va. — Pleasant Valley Hospital has announced its Customer Service Employee of the Month for May and June. 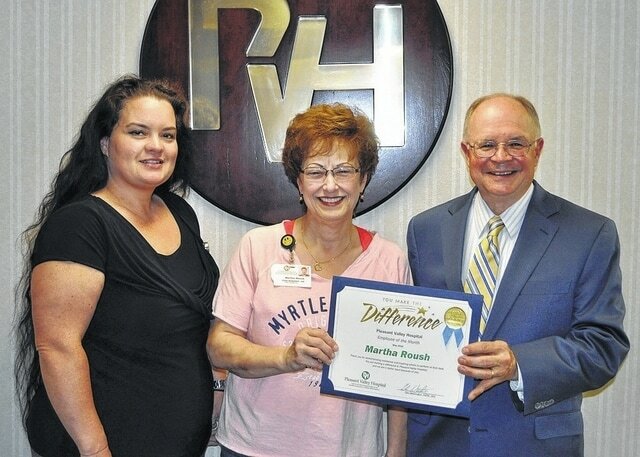 May’s Customer Service Employee of the Month was Martha Roush in Home Health and Hospice. Martha has been employed with Pleasant Valley Hospital since May 1999 as a registered nurse. This is the second time winning she has won Employee of the Month honors. “Martha is a wonderful nurse who treats every person she comes in touch with in a very personal and compassionate way. Her calming demeanor is ever-present, even when her day is anything but calm. Her patients and coworkers are all treated as family, and her deep spirituality guides her care every step of the way. She is a joy to work with, and I am blessed to call her a friend,” said Mistie Best, director of home care services. Martha and her husband, Tom, live in Point Pleasant. She enjoys gardening, sewing and spending time with her family and especially her grandchildren. June’s Customer Service Employee of the Month is Jenny Nottingham, physical therapy assistant. Jenny started working for PVH in August 2011 and, after a short time, was chosen to lead the physical therapy team through the six-month transition to electronic medical records. “Jenny embodies what it means to be a leader, a team player and a role model of PVH core values. Through the transition, the entire team worked hard and provided quality care for our patients while learning how to master the new electronic medical records program. Jenny continues to teach and provide answers to improve the process for patients as well as her coworkers,” said Paul Harris, director of rehabilitation services. Jenny and her husband, Joe, live in Racine, Ohio. They are looking forward to the birth of their first daughter in September. Both Roush and Nottingham each received a $50 check and a VIP parking space. They will also be eligible for the Customer Service Employee of the Year award with a chance for $250.